If you are looking for beach vacation ideas on the East Coast, South Carolina is a great place to go. The state is home to awesome beach resorts which will let you relax in the sun, get pampered at the spa and try new activities with kids. 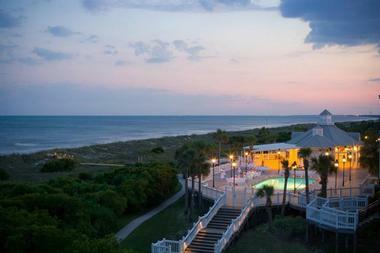 Check into one of these awesome SC resorts on our list for a fun, unforgettable family trip. 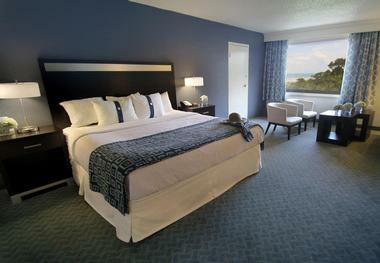 Charleston Harbor Resort and Marina is a 125-room resort that is perfect for family vacations or a corporate retreat. The resort has gorgeous views of coastal shorelines, seascapes, and rows of palm trees and offers a wealth of amenities, including a private beach area, a seasonal pool that comes with pool side service, three different restaurants, three different bars, bike rentals, and fishing activities. 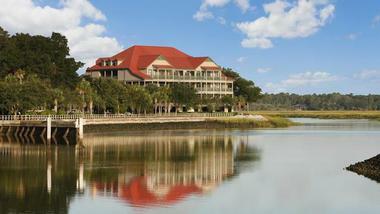 Montage Palmetto Bluff is located along the May River and is known for its nature preserve. The resort has many walking trails, four distinct restaurants, as well as a signature golf course and signature spa. Located on the premises are also a shooting club, freshwater and saltwater fishing, and kayaking activities. The resort sits on 20,000-acre development and has over 10,000 square feet of meeting space. All of the accommodations are spacious on the inside, and you can either have a suite, village home, or cottage. The resort is fairly close to the nearest airport, which is only twenty-three miles away. The community is vibrant, and there are village ruins to explore and a rich history of culture and art to experience. 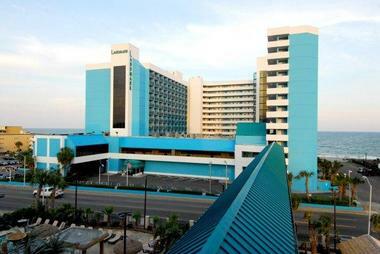 The Landmark Resort has unique amenities and is an extremely popular vacation destination in the Myrtle Beach area. 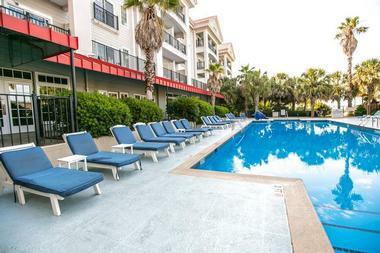 Not only is it conveniently located along Myrtle Beach, but it is also close to the area’s best attractions, including shopping, entertainment venues, and restaurants. 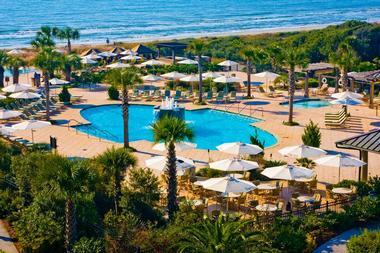 The resort has a water park, a nine-hole mini golf course, outdoor water attractions, and seventeen indoor pools. The water park is home to lazy rivers, children’s pools, and even whirlpools. They have a free airport shuttle service to and from the international airport, and the resort does allow the hosting of events in their 20,000 square foot meeting area. Keep reading for more unique South Carolina resorts. 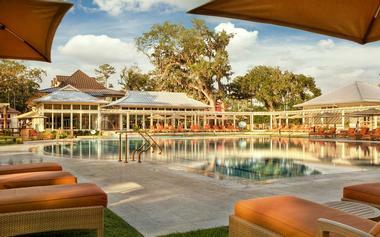 The Sanctuary at Kiawah Island Golf Resort is a luxury beach hotel located near Charleston. 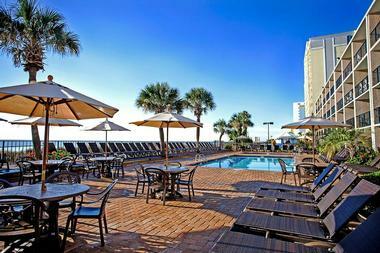 The hotel is a seaside mansion that boasts grand architecture and classic Southern hospitality. The accommodations include 255 suites and rooms, as well as king sized rooms that sit at 520 square feet. The Inn and Club at Harbour Town at the Sea Pines Resort is a luxury hotel located on Hilton Head Island that provides guests with superior service to ensure every vacation is an amazing one. The hotel is replete with many features, including spa services, terrace lounges, poolside food services, stone decks, and plenty of opportunity for discovery and recreation. The hotel has premiere tennis courts, a fitness center, self-guided tours, a bicycle shop, and eco-adventures. Plus, Hilton Head is a destination for luxury yachts, so there is a full service marina. You can enjoy the open waters by either buying or renting any of the boats, or you can choose to go kayaking. The resort also offers fishing and horseback riding at the nearby stables. There are three unique restaurants: Sea Pines Beach Club, Links (American Grill), and Live Oak. Keep reading for more unique South Carolina resorts. 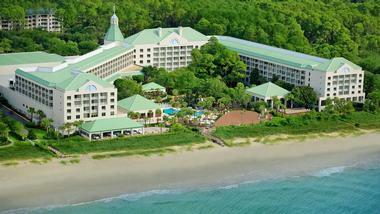 Disney’s Hilton Head Island Resort provides visitors with a very unique vacation destination. It is located only five hours from Walt Disney World and is situated on the coast of South Carolina with the architecture of a 1940’s lodge. The hunting and fishing lodge architecture, meshed with local charm, provides families and individuals with many outdoor activities. Amenities include world-class golf courses, a 72,000 gallon heated pool and spa with wraparound water tower slide, and, of course, the sandy beaches of the Atlantic. There are over 12 miles of beaches that offer the perfect paradise for sunbathers and miles of terrain to explore for those who enjoy bicycles. Staying at the Inn at Palmetto Bluff offers visitors a unique experience unlike any other, as you will end up staying within a vibrant residential community. Not only do you get to relax among the wildlife, and create connections with the people who live there, but you also benefit from an enriched experience. Palmetto Bluff has many charming rooms, cottages, and vacation homes nestled amongst the waterfront or within the forests, providing guests with beautiful views. From luxury vacation homes to Southern style cottage suits with vaulted ceilings, there is a mix of everything in Palmetto. Whether you spend your time hitting the world-renowned spa, eating Oysters by the May River, or biking through the forest, Palmetto is a magical destination. The Westin Hilton Head Island Resort and Spa is heavenly to the eyes with its stunning ocean views and relaxing recreational activities. The resort has a family kids club and a spa for the parents, as well as golf courses for those who like to relax amongst the rolling hills. There is also a racquet club for anyone who wants to perfect their tennis stroke. The resort has twelve miles of pristine beach, so all who enjoy surfing, sailing, boating, fishing or sunbathing will not be disappointed. There are five restaurants and bars on-site that provide a wide range of dining options and have varying hours of operation. For those guests who may need rental space, there are nineteen flexible rooms, catering/conference services, as well as 40,000 square feet of space, with 10,000 of it being oceanfront. The Wild Dunes Resort is perfect for those who want gorgeous boardwalks along the oceanfront or a culture enriched experience by exploring the historic downtown city. Award winning golf courses make their home here, and tennis courts are a plenty. 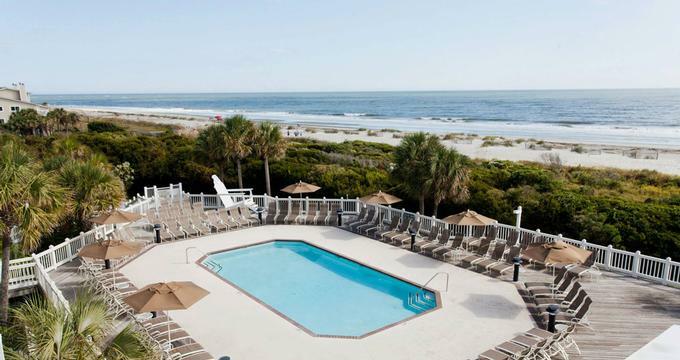 The Wild Dunes Island Resort has a large variety of accommodations, including The Boardwalk Inn and The Village, which are four diamond properties. The Marriott Resort at Grande Myrtle Beach sports rooms with beautiful views of the resort and gorgeous beachfront vistas. All of the rooms come with marble bathrooms, deluxe bath products, and custom linens. The hotel has five different options for breakfast, as well as The Oceanfront Restaurant, OceanBlu lunch restaurant, The Cove, which offers a laid back American dining experience, and a bar that serves cocktails and appetizers all on the resort property. As for activities to do, there is the Hibiscus Spa, which offers body scrubs, wraps, kids services, lip treatments, couple’s massages, and much more. The resort has a fitness center and is close in proximity to many championship golf courses. The Hilton Myrtle Beach Resort is a stylish resort known for its digital check-in system, no booking fees, and amazing room deals. It is a popular resort because it is so close to over 100 different golf courses and activities, and it comes with private balconies in all of the guest rooms. The resort boasts the Royale Day Spa, which is a full featured spa that does nail treatments, wraps, massages, and more, plus the resort is home to a waterpark and a health club, which is perfect for those who like to stay active. The hotel is close to entertainment venues that are offered by Broadway along the beach and to the Beach House Blues, the Alabama Theatre, and the Tanger Outlet Mall. All restaurants, golf courses, and most activities are within walking distance, or are only a short car ride away. The Sand Dunes Resort and Spa offers guests everything they could ever want without ever needing to leave the resort property. The Sand Dunes Resort and Spa offers one, two, and three-bedroom villas and condominiums with gorgeous ocean views, private balconies, and beachfront patios. On the property, you will find amenities such as five-star restaurants, health clubs, spas, volleyball and table tennis courts, whirlpools, and indoor/outdoor pools. There is a waterpark, an arcade, covered parking, and a concierge service. 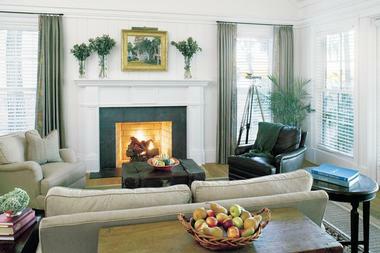 All villas come equipped with free wireless Internet, in-room safes, a private balcony, and individual climate control. Children ten and under eat breakfast free, and children under the age of eighteen stay free when accompanied by parents. The Compass Cove Oceanfront Resort is a family oriented resort that has been providing visitors with ample entertainment in the Myrtle Beach area for decades. The resort has twenty-two different pool features alone, including indoor and outdoor pools, lazy rivers, hot tubs, and areas just for children. The resort has plenty of units to choose from, including two and three bedroom rooms as well as rooms that are right on the oceanfront. In addition to offering an array of water amenities, the resort has a kids’ club, a giant chess and checkers play board, shuffleboard, a games room, a business center, a fitness center, laundry services, and a gift shop. The resort also offers golf packages and tee times to many clubs in the area! There are also hundreds of attractions and over 1,500 restaurants to choose from in the Myrtle Beach area, all of which are accessible from the hotel via public transportation or rent-a-car. The Beach House, a Holiday Inn Resort, takes the beach house lifestyle and pairs it with the amenities and accommodations that you would expect from an upscale resort. Relaxation and recreation is what this resort is all about, providing visitors with plenty of shoreline to sunbathe on and paved trails to walk. You can also do bicycling, paddleboard, and canoeing, and there are thirteen championship golf courses to choose from. It’s perfect for couples who want a romantic get-a-way, the surf adventurer, the beach bum, families, or those who are avid golfers. The resort also holds weddings, has fine dining, and does hold events throughout the year.